I’m confident that most if not all of my readers have shopped at least once in the “giant ‘big box’, has everything, supercenter store”. If there should be one who hasn’t had that experience, I urge you to venture into that dominion. That should be on your “bucket list”. But be prepared for the consequence. Yesterday, I accompanied the “Rancherette” on our weekly outing to the friendly supercenter for much needed supplies. We do everything together. We work together, play together, eat together, so it makes sense that we shop together. Our path is pre-ordained. We enter the store, proceed to the pharmacy, (at my age there is usually a prescription to be picked up), then on to the Health & Beauty section. The “Rancherette” does not need anything from here, but I do. At last visit, they did not have any such beauty aids that would be of assistance to me, but I spend a lot of time in the Health Department. Since the beauty section is on the opposite end from the grocery section, we must then travel through the various departments including the fashion department, and usually with a stopover in each with a detour for a pit stop along the way. (Think health needs).Occasionally, we slide through the craft department, for the “Rancherette” is very crafty. As we make our way through the store to the foods the travel gets perilous. Pushing a cart through the supercenter is risky to say the least. I have a couple of ideas that might make it a little safer, or not. 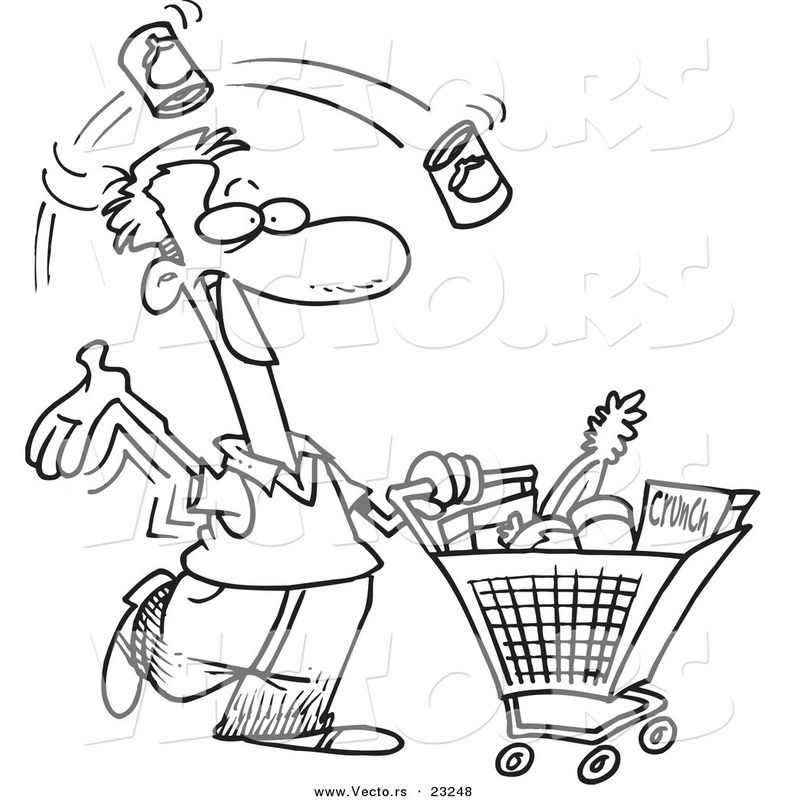 First, a pushing cart license should be required before entering the store. They could set up a kiosk at the entry and charge a fee, either for a one trip or annual permit. Instruction booklets could be found in the Home & Office department. A short one week course with field training could be utilized during nights and weekends when traffic is lightest if there is such a time. Believe me; many people are in need of a degree of instruction. For example, some use the British model, you know, pushing on the “wrong” side of the aisle, while others use the American model, pushing on the “correct” side of the aisle. Still others use no model at all. Some use the haphazard model. It is very confusing. And there are the “wrong way” pushers. They are oblivious of anyone around them. 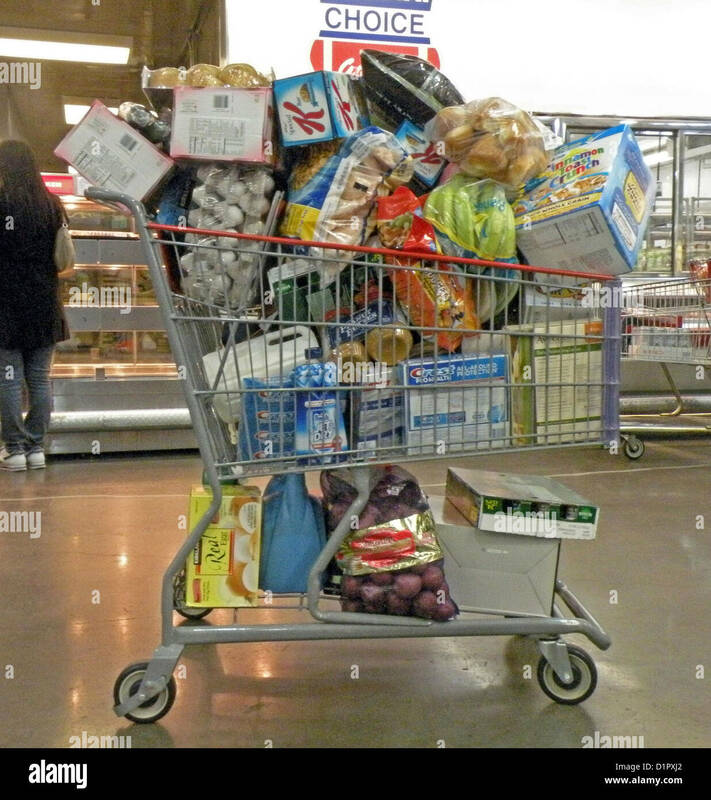 One can be pushing the correct direction, either British or American and out of nowhere comes a cart from the wrong direction and stacked so high the “pusher” cannot see over the mound of stuff, usually with soft drink bottles hanging off the side. You know, “East is east and West is west, and never the twain shall meet.”(Except in the “Big Box Supercenter”.) As you see, in the photo above, one can find anything in a “Big Box” Supercenter. And with the “medians” in the middle of the wider aisles one never knows which side to move. The narrow aisles do not have these obstructions, so this is where the motorized shoppers meet to discuss current events. In fact, the “big box” supercenter could set aside a section like a park, where these individuals could meet. The supercenter could then charge admission. All this could be corrected with “pushing licenses” instruction. One solution would be to make the aisles a one way direction. It might not solve every problem but it might solve a few. See diagram below. Notice in the diagram, there is only one check out location. This is controlled chaos. All the stores use this method to keep order. As we proceed down the aisles we pass all the well known “impulse” items, usually not on our list but placed exactly at eye level. The managerial staff knows when I am coming. Being the sucker I am, I load the basket. But we must also locate the items on our list. Bottom shelves are not knee friendly nor is the fiber cereal on the top shelf. This is an area where the supercenter needs a bit of instruction. If they would call me, I would tell them where to put stuff. They do not understand such logic. I do. Eventually, we make our way through the checkout. As we leave the store, we converse about how exciting it is to see the many exhibits (exhibitionists) throughout the store. Kind of makes your venture worthwhile. Since this is a family friendly site, I will not describe all the varying displays throughout the supercenter. Let just say, one can see things in there that are not available even in the zoos of the world. Children under 16 years of age should not be admitted, many are simply unsuitable for young adolescents. But hey, we gathered our groceries, now you gather your courage and get out there and go “pushing”. Several years ago, I wrote a weekly column for a local newspaper in Eastland County, Texas.I lived on Lake Leon and since that was my residence, I titled my column, “Puttering Around Lake Leon. I have since moved on to East Texas, however, ”In re-reading some of those columns, I decided to publish a few of those that seem to continue to have relevance today. I have listed a category on Rancherwriterpoet that I have named “RETRO”. In my column, each week, I attempted to make certain comparisons to life’s circumstances by using a bit of humor as well as reminiscing about the “Good Old Days.” They also include my opinions concerning Christian Life. I confess, I am not theologically trained, thus I choose not to engage in any back and forth discussions. I accept your comments gratefully and appreciate them very much. This first “Retro” post seems to fit right in with the most recent rains we have had lately. During the recent rains and for that matter every time it rains, my satellite dish goes on the fritz. The box tells me the signal has been lost. It occurred to me that no matter how far technology has come in my lifetime, I am still technologically (I can type it, I cannot pronounce it) challenged. When I was a kid, I think thirteen or fourteen; I was a huge fan of the rock and roll music during that era. Actually, I still am. Maybe you remember those records, “Wop Bop A Lu Lop… Good Golly, Miss Molly… Move Over, Beethoven…” If you do, then you are as old as I am and maybe as technologically challenged as me, but who am I to throw stones. Anyway, I lived in a small town in East Texas and as I recall, the local radio station never played such “outlandish” music, “music of the devil” I was told. That would be my dear grandmother, God rest her soul. It was left up to us boys to find it wherever we could. I had a small radio with a dial that required very fine-tuning to locate a station. This is when I began my technology training. The radio station, WLAC, Nashville, Tennessee, played MY kind of music. The only problem was I could not pick it up until very late at night. That time of night as well as the type of music was unacceptable to my mother. I failed to see the enormity of it. But, then, I discovered that if I tied a wire onto the window screen and attached it to the back of the radio I could pick up the station more clearly and thus I could play it more softly, thereby not disturbing my mother. It worked! Soon my friends around town were attaching wires to their radios and we were dancing the night away to Little Richard and Bo Diddley. That is, until my mother confiscated my antenna. I suffered a jolt to my system from which I never fully recovered. Lest there be any misunderstanding, though, I carry no grudge or ill will concerning my mother. I simply moved on with my life and got my music fix down at Buddy’s Dairy Bar. Fast forward to modern days. Time moves on and with it, advances in technology. I was left in the cold; somewhere back in Eight Track Days. I received my first cell phone in 1985. It was called a mobile phone in those days and weighed about three pounds. It certainly wasn’t very mobile. It was more like a suitcase. But, I never learned to program it. I enlisted my enlightened co-worker to accomplish that task. Newer phones became smaller and smaller, even fitting into my shirt pocket. I retired in 2006 and retired the phone as well. After all, I never did learn to use all the features that came with it. And today, we have txt msgs, whatever that means. LOL. I got my first computer in 1990. I almost ruined it the day I plugged it in for I knew nothing about a computer. I have not advanced much since then, either. I am in awe of the meteoric advances in technology, today, even though I have been left far behind. Programming the VCR was a hindrance to me as well. My son in his early ages conquered that problem. Then came the DVD player. My grandson accomplished that task. The digital camera was next. My granddaughter was responsible for that programming. On that subject, I fail to see how those pictures come out when there is no film inside. Last year, my house flooded and I had to replace the electric range. It had to be programmed as well. Fortunately, the customer service technician was very helpful. It required only two phone calls, thirty-seven minutes on hold and about an hour later, I could boil water. However, my most serious problem arose with the satellite dish. This thing sets on my roof, facing the southwestern sky and when I turn on the television, (which I might add, I needed the assistance of my eight-year-old nephew to program), I usually receive a picture. Except of course, when it rains. The screen tells me the signal has been lost. There is absolutely nothing I can do to retrieve a picture until it quits raining. Then the thing does it completely without my help. I am thankful for that. This thought occurred to me. You see, all these other devices, the radio, the camera, the VCR, the DVD, the telephone, the electric range, my computer, the vacuum cleaner, the washing machine, the microwave oven, all electronic devices for which I needed help to program, ALL of these items continued to work in the rain. But not my satellite dish. This is the only device I own that must be pointed to the sky in order to work properly. I know that signals must be received from that orbiting contraption if I am to view any program on my television. Human intelligence, human ingenuity, although given to us by God, nevertheless, is hampered by our reluctance to acknowledge the Creator and His total creation. These magnificent devices that we cannot do without, pale in comparison with the wisdom that comes from God. On good days, the signals from the satellite are received without a thought. It seems that way in our ordinary life. Only in the rain do I complain. Yet, God’s signals are never lost. We may tend to ignore them, to turn the set off, but they are not lost. In fact, it is a two-way communication system with Him. The Bible is the complete communication device. The only programming I need to use this device comes from the Word itself. “For whoever calls upon the name of the Lord shall be saved.” Romans 10:13. If I point my heart to the heavens, communication is instantaneous. I may be technologically challenged, but God is my programmer. He can be your programmer. Just point your heart to the heavens and ask. More information can be found in His Instruction Book or through Customer Service. I cannot pick up WLAC, Nashville, Tennessee. Not even with a copper wire tied to the window screen. Besides, they don’t even play MY kind of music anymore.